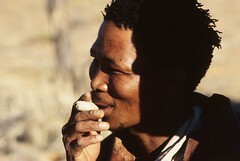 This page is all about the bushmen of the Kalahari. This is serious. The Botswana government are trying to push the bushmen out of their tribal homelands. The land of the No 1 Ladies Detective Agency is not as sublime as you might think. Speaking as one who has lived in Botswana I have an idea what they are up to. I lived in Kang for a while – that is right in the Central Kalahari region. I saw at first hand how the Batswana hate the bushmen. They treat them like an underclass and the move to push them out of the KCGR (Kalahari Central Game Reserve) is all about class and diamonds. Botswana is a modern African democracy and doesn’t want bushmen anymore than Australians wanted aborigines. Also they are sitting on diamonds and this is the most importnat mineral on the Botswana export list second only to beef. You can read more on the Survival International website.